The metallic stearates market is projected to grow from an estimated USD 2.97 billion in 2016 to USD 3.85 billion by 2021, at a CAGR of 5.4% from 2016 to 2021. The major factors that are contributing to the growth of the metallic stearates market include the increasing demand from the polymer and rubber industry and the high demand for magnesium stearates in pharmaceutical and cosmetic applications, among others. Metallic stearates are used by end-use industries as lubricants, waters repellents, and other applications. These goods find applications in several industries such as polymer & rubber industry, pharmaceuticals & cosmetics, building & construction, and paints & coatings. In this study, 2015 has been considered the base year and 2016-2021 as the forecast period to estimate the metallic stearates market size. Metallic stearates in the past few decades have evolved in terms of the number of grades custom made for particular application requirements. There are a number of metallic stearates available for a particular application. This enables the availability of higher options for end users of metallic stearates, due to which, they can select particular grades to meet their requirements. Major companies are making investments to develop compatible grades that can be used for specific applications. This can be seen particularly in the pharmaceuticals and cosmetics industry that has stringent regulations for the materials to be used. The polymer and rubber industry is evolving with complex applications for products; and is also a major industry that has been driving the market for the customized grades. Secondary sources such as company websites, directories, and databases such as Hoovers, Bloomberg, Chemical Weekly, Factiva, and other government and private websites have been used to identify and collect information that is useful for this extensive commercial study of the metallic stearates market. Primary sources, which include experts from related industries, have been interviewed to verify and collect critical information as well as to assess the prospects of the market. The top-down approach has been implemented to validate the market size. With the data triangulation procedure and validation of data through primaries, the exact values of the overall parent market size and individual market sizes have been determined and confirmed in this study. The breakdown of primaries conducted is shown in the figure below. The ecosystem of the metallic stearates market consists of suppliers of key types such as zinc stearates, calcium stearates, magnesium stearates, and aluminum stearates, among others. Several companies such as Baerlocher GmbH (Germany), Dover Chemical Corporation (U.S.), FACI S.p.A (Italy), Peter Greven GmbH & Co. KG (Germany), Sun Ace Kakoh (Pte.) Ltd. (Malaysia), and Valtris Specialty Chemicals (U.S.) are engaged in the production of metallic stearates. The demand side users include companies from the polymers & rubbers, pharmaceuticals & cosmetics, building & construction, paints & coatings, and others industries, which use metallic stearates as various applications such as lubricants, anti-caking agents, and release agents, among others. In January 2017, Baerlocher USA (Baerlocher GmbH) has planned the expansion of its metal soap production capacity by 50% to meet the growing industry demand, and drive innovation. In April 2016, Valtris Specialty Chemicals acquired Akcros Holdings Limited, a specialty chemicals provider with operations in North America and Europe. In April 2015, Peter Greven GmbH, started a new production facility for metallic soaps at its site in Penang (Malaysia) in April 2015. 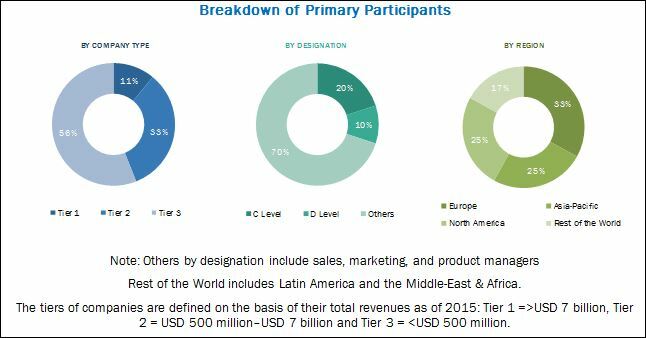 This research report categorizes the metallic stearates market based on type, end-use industry, and region, and forecasts revenue growth and provides an analysis of trends in each of the submarkets. Each end-use industry is further described in detail in the report with value forecasts until 2021. Each region is further segmented by key countries, such as China, India, Japan, South Korea, the US, Mexico, Canada, Germany, the UK, Italy, France, Saudi Arabia, Egypt, South Africa, Argentina, and Brazil. The metallic stearates market is projected to grow from an estimated USD 2.97 billion in 2016 to USD 3.85 billion by 2021, at a CAGR of 5.4% from 2016 to 2021. The rising demand from the pharmaceuticals & cosmetics industry is expected to drive the metallic stearates market. Growing demand from the Asia-Pacific region from end-use industries such as polymer & rubber is also expected to fuel the demand for metallic stearates. The metallic stearates market has been segmented on the basis of type, end-use industry, and region. 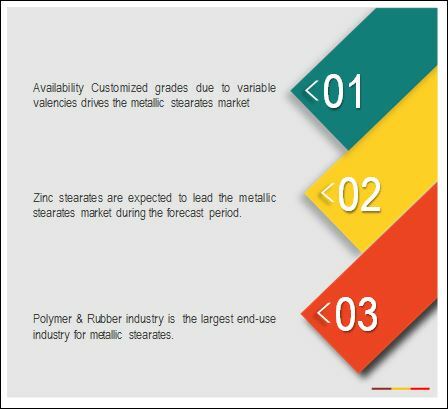 Based on type, the zinc stearates segment led the metallic stearates market in 2015, owing to its wide-ranging applications across various end-use industries. Based on end-use industry, the polymer & rubber segment led the metallic stearates market in 2015, due to the rise in demand for PVC and other polymers. Demand for customized grades from end-use industries with their variable valencies is driving the demand for metallic stearates. The Asia-Pacific region led the metallic stearates market in 2015, and is expected to grow at the highest rate during the forecast period, owing to the increasing demand for metallic stearates from countries such as Japan, China, India, and South Korea, among others. Improving economies of scale, and increasing polymer & rubber processing activities in the region are expected to drive the Asia-Pacific metallic stearates market. The polymer & rubber industry is a major market for metallic stearates wherein they are used for thermoplastics and processing unvulcanized rubber. Most of the metallic stearates are used as lubricants in polymer processing, and are good water repelling agents as well as releasing and gelling agents. Metallic stearates are largely used in powdered form on unvulcanised rubber to prevent decomposition. The major types of metallic stearates that are used in this industry include zinc stearates, calcium stearates, magnesium stearates, and others. Zinc and calcium stearates. Metallic stearates find a large number of applications in the pharmaceuticals & cosmetics industry. The market is one of the fastest growing for metallic stearates and is expected to register the highest CAGR during the forecast period. Among all types of metallic stearates used, calcium and magnesium stearates have an increasing number of applications in this industry. Major manufacturers focus on specialized grades of these materials that are suitable to meet the requirements of this industry. Increasing concerns on the use of zinc stearates have affected their growth to a large extent, and these are expected to lose their market share to calcium and magnesium stearates during the forecast period. Metallic stearates are used as additives in the building & construction industry, and are used as lubricants, flatting agents, hydrophobic, and thickening agents. With high infrastructure growth in the emerging regions, the metallic stearates market in regions such as the Asia-Pacific is expected to witness high growth during the forecast period. Major grades among these types include zinc, calcium, and magnesium stearates. Metallic stearates are used in the paints & coatings industry largely as preservation additives and enhancers. Metallic stearates along with other additives are added to control the viscosity and surface properties of paints. Major types include zinc stearates, calcium, magnesium, and aluminum stearates. Zinc stearates are used for flatting and lubrication for sanding sealers. Calcium stearates are used as waterproofing and flatting agents in lacquers, and aluminum stearates are used as flatting agents, thickening, pigment suspension, anti-foaming agents. Where will all the major developments take the industry in the mid to long term? What are the upcoming industry applications for metallic stearates? Impurities in the form of traces of other fatty acids along with stearic acids are not acceptable in critical applications. 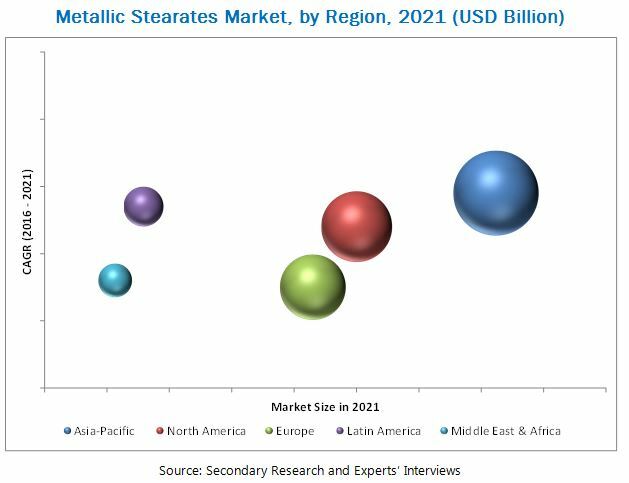 Therefore, metallic stearates market growth is restrained due to the absence of structured markets in case of bulk grades wherein there is a presence of a large number of manufacturers providing generic grades that are used as bulk materials. In addition, market penetration is easy in case of general grades, thus leading to increasing numbers of new suppliers. Baerlocher GmbH (Germany), Dover Chemical Corporation (U.S.), FACI S.p.A (Italy), Peter Greven GmbH & Co. KG (Germany), Sun Ace Kakoh (Pte.) Ltd. (Malaysia), Valtris Specialty Chemicals (U.S.), Norac Additives (U.S.), PMC Biogenix, Inc. (U.S.), James M. Brown Ltd. (U.K.), Nimbasia Stabilizers (India), Marathwada Chemical Industries Pvt. Ltd. (India), Lumega Industries (India), Seoul Fine Chemical Ind. Co. Ltd. (South Korea), and IRRH Specialty Chemicals Co., Ltd. (South Korea) are the major players in the metallic stearates market. These players have been focusing on developmental strategies of mergers & acquisitions, expansions, and divestments that have helped them to expand their businesses in untapped and potential markets. 11.11 Marathwada Chemical Industries Pvt. Ltd.